Get ready to get your daily dose of winnings with this great 25-line video slots game! Some adorable mice have taken over Las vegas to guarantee amazing prizes and hours of fun. On Mice Dice everyone walks away a winner with 2 great progressive guaranteed jackpots and a win-win extra bonus feature. Join in the adventures of these mice as they take over the City of Sin and try to maneuver their way around the casino. Keep your eyes open for the scattered dice symbols, which will multiply your wins and will help you trigger the bonus round where you can win loads of cash prizes. Join forces with these clever mice and score huge payouts here! Mice and Dice is an easy to play 25-payline, 5-reel video slots game. To play, first set the number of lines in which you'd like to place your bets. You can choose anything between 1 to 25. Next, set the amount of money you'd like to play with. You can start with as little as $0.01 and go up to as much as $100.00 per line. To play, click on the button marked" Spin" to set the reels in motion. Use the Autoplay function to set a predetermined number of spins to run automatically so you can let the game run on its own while you rack up the cash! You can stop the feature at any point in time with just a touch of a button. Want to win big? Spread your bets around! It's always better to bet on more lines with a fewer value per line than betting a large amount on a few lines. With 25 lines it does look a little crowded sometimes. Remember that the more lines you bet on the higher the chances you have to win something! Plus, in order to win the big jackpot you need to bet on the max number of lines, so spread your bets around – it doesn't mean you have to actually bet any more at the end of the day! 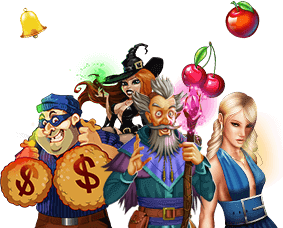 If you want to get a feel of the game before playing for real money, you can do so at our free slots section, where you can play without restrictions. Wild Symbols: The wild symbol in Mice and Dice is the Casino symbol. Whenever it comes up, it will help you create a winning combination so you can enjoy higher payouts! Scatter Symbols: The scatter symbol of Mice Dice is the Dice symbol. Encountering 2 or more of these on one line will mean your prize will be multiplied. By getting 5 of these, the bonus round will be triggered! Win-win Feature: Everyone wins at Mice and Dice. If you trigger the bonus round and don't manage to win any free spins, the win-win feature will come into effect giving you a 50x prize multiplier on your triggering bet!